Do You Need an Agency That Follows Agile Marketing? Should You Consider a Digital Marketing Agency That Follows Agile Marketing Principles? A feature of mapping apps that I wish existed: agility. We’ve all been there. At the moment you mapped your route to your next destination, there was no traffic. As you’re cruising down the road you notice of trail of brake lights distantly in front of you. You pull up your map application only to find that your clear roadways have transformed into dots of red lines for the next five miles – and your arrival time has been set back 30 minutes. If the map application had the agile ability to automatically re-route based on the new traffic information, you’d be cruising along side streets to get to your destination at a reasonable time. The same concept of agile mapping applies to digital marketing; however, many marketing agencies still operate with a firm timeline of goals and deliverables that are established at the very beginning of a program, and lack the practice of adapt and reposition based on changing client needs and competitive environments. In this post, I’ll cover an introduction to agile marketing, as well as some benefits that our team and our client’s have experienced along the way. 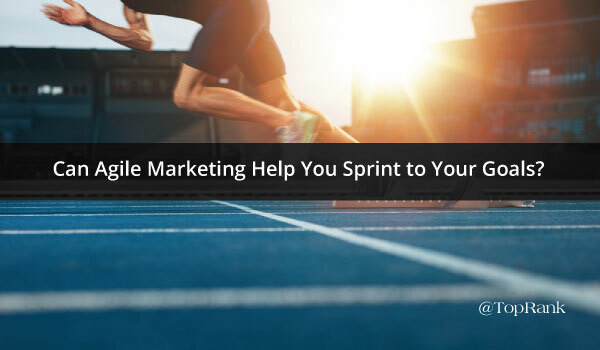 By implementing an agile approach, marketing teams and agencies are able to improve speed to deliver on high-impact results and gain adaptability based on results of these shorter sprints. When we’re constantly testing short-term sprints, the ability to understand the way in which our audience responds is achieved at a much faster rate. As a result, TopRank Marketing is now able to hone in on what works and what doesn’t much earlier in the game, resulting in better results for future short and long-term goals. We work directly with marketing professionals at many levels: VPs of Marketing, CMOs, Marketing Managers, Content Managers; all of which have a responsibility to keep stakeholders updated on progress and their marketing budgets return on investment. This can be particularly challenging for larger, more long-term objectives where an end deliverable or result is months away from fruition. Take for example the objective of achieving thought leadership for a particular topic. Months of content creation, asset development, influencer engagement, search engine optimization and paid amplification are baked into an objective of this stature. Instead of working heads down for three months on each facet, agile marketing gives agencies the ability to break this goal into smaller, yet high-impact sprints. The results of each sprint can then be reported back to key stakeholders, with wins celebrated along the way. When client’s first sign an agreement with an agency, there is some discovery completed to determine what the best mix of services and approaches will be to help the client reach their goals. However, with the quickly evolving landscape of digital marketing, it is impossible to determine if those same services will be the best fit down the road. An agile approach to marketing breaks down barriers and enables account teams to help clients determine the best mix for their marketing success now, and plan for future ways that this mix can evolve. While the benefits of transitioning to an agile approach are proven and abundant, making the transition is no small feat. A recent study published in CMG’s Sixth Annual CMO’s Agenda shows that while 63% of CMOs say agility is a high priority, only 40% call themselves Agile. Becoming agile requires both leadership and team commitment for success, and requires a disruption of historical processes that may at times feel uncomfortable. Through TopRank Marketing’s transition, we have found that this approach has created more velocity, increased collaboration and has helped us meet a major objective which is to help our clients to be the best answer for their customers, wherever they are searching. Hm, certainly an approach worth considering.